The California Fire Foundation invites you to join us in remembering the sacrifice of our fallen heroes at the 15th Anniversary California Firefighters Memorial Ceremony on September 30, 2017 in Sacramento’s Capitol Park. On Friday, September 29, 2017, the Foundation will also be hosting a tribute honoring the 15th Anniversary of the California Firefighters Memorial. The California Firefighters Memorial is a lasting tribute to the men and women who gave their lives to protect their fellow Californians. Located on the grounds of the California State Capitol in Sacramento, this stunning memorial depicts the heroism of the profession and the anguish felt when a firefighter falls in the line of duty. The centerpiece of the California Firefighters Memorial is a stunning brushed limestone Memorial Wall with the names of more than 1,300 California firefighters who have died in the line of duty since 1850. The Memorial Wall is framed by two bronze statues depicting firefighters in action. One statue — Holding the Line — features four firefighters working together. The other — Fallen Brother — shows an anguished firefighter carrying his “fallen brother” away from the flames. 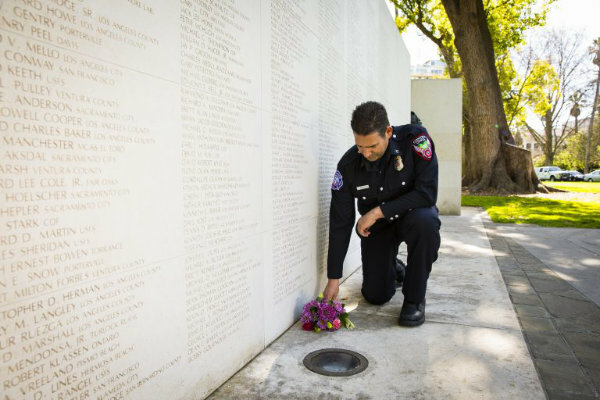 In the autumn of each year, the California Firefighters Memorial Ceremony honors fallen firefighters and their families, and performs the sad task of adding new names to the Memorial Wall. The ceremony features a moving uniformed firefighter procession, personal tributes and the presentation of a U.S. flag to the families of those whose names are newly added to the Memorial. The ceremony has become a touchstone for the profession, and a chance for firefighters, families and ordinary citizens to grieve and remember together.